A while back I read about The Big Gay Ice Cream Truck coming to New York. I emailed owner Doug Quint right before my trip to NYC and as luck would have it, he planned to open it my second day in the city. However, monsoon rain and winds in the city prevented Ashu and me from going out and Doug from opening on his opening day. I had to leave the city to head down to New Jersey, and Doug opened his truck without me there. I settled for the next best thing: an online interview with the man himself. Doug: I’m your typical gay, middle-aged bassoon player who drives an ice cream truck. I grew up in a small town called Pittsfield, Maine. I moved to NYC for conservatory training at Manhattan School of Music and then continued at Juilliard. I play the bassoon in various orchestras and chamber music groups in both Boston and New York. I just finished all of the course work for my doctoral degree- I’ve been attending CUNY- so I’m about to start writing dissertation proposals. I had an urge to do something different with my life this summer, and the opportunity to drive an ice cream truck came about. How could I turn it down? 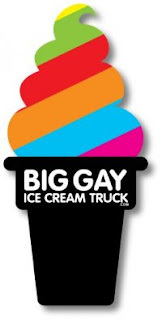 I decided to create an identity for the truck, and thus the Big Gay Ice Cream Truck was born. Scoopalicious: Are you our vending ice cream every day, all day? Doug: I don’t do this every day. I continue as a performing musician, and I need plenty of time to “keep my chops up” with concerts, rehearsals, and practice. In addition there is much to be done to keep the truck menu current, work on scheduling and press, and basic logistical work that I couldn’t do if I tried to operate every day. 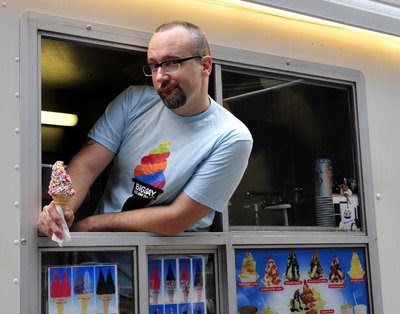 Scoopalicious: I read something about you in a New York Times article: "...the Big Gay Ice Cream Truck is driven by Doug Quint, a doctoral candidate in bassoon performance at CUNY. 'The whole Brooklyn Philharmonic season was canceled,' he said. 'I have to get through the summer somehow.'" That answers my question of "What were you doing before you decided to open the truck?" but brings up a whole slew of other questions. First off, do you ever play the bassoon from the truck? Doug: Ugh, no! Ice cream trucks are a sticky mess. I’m not bringing my bassoon anywhere near one! Scoopalicious: What was the thought process from "no Brooklyn Philharmonic season" (sorry about that, by the way) to "Let's open a big gay ice cream truck!"? Doug: It wasn’t quite the linear progression that The Times bit might make you think. Freelancing is always a little slow in the summer, so a “side job” is a natural thing for lots of us. With orchestras saving money by downsizing and some groups canceling entire seasons (like The Brooklyn Philharmonic, as I mentioned to The Times) it seemed as though this summer, in particular, would be a good time for an interesting work endeavor. Scoopalicious: Who is Ryan Petroff, Little Gay? Does he have his own truck? Doug: Bryan (not Ryan, you silly) is my boyfriend. He’s the voice of reason in this project, and also the palate behind many of the menu items. Scoopalicious: [Oops! So sorry, Bryan!] How is business? Doug: The weather has improved and the press has been great, so things are starting to really pick up. I’m pleased. Scoopalicious: How has the bad weather this summer affected business beyond the obvious annoyance to both you and I of your kickoff day being postponed? Doug: It’s true -- people don’t come out for ice cream during monsoons! Scoopalicious: Sounds like there are some turf wars going on in the city. Have you been negatively affected by this? Doug: Not in the least. I find most of the vendors to be good guys. They are on their feet, working like mad for very little money. Most want to work with you to increase traffic and get the goods sold. I hear the stories, but really I find that street vendors make an effort to be comrades, not enemies. Scoopalicious: It also sounds like you don't have a permanent spot. You have been using Twitter quite creatively to let people know where you will be -- how is this working out? Doug: Amazingly. I tweet the locale and people magically appear. They come to the truck like they have won a scavenger hunt! I also tweet the menu, so many folks know what they want before they leave for the truck. Scoopalicious: Tell me a bit about your awesome logo and the talented desginer who made it for you. Doug: Jason O’Malley (www.jasonomalley.com) is a good buddy of ours. When he learned of my concept for the truck he volunteered to work on a logo; I couldn’t have been happier that he offered, because I was one phone call away from begging him anyhow! I knew he’d come up with something that I’d love, and he did it. The logos played a big part in our initial days. Before there was a physical truck we had this catchy design and people took notice. Above, Doug serves a cone from The Big Gay Ice Cream Truck. Scoopalicious: OK. We really should talk about the ice cream. Do you carry novelties or just ice cream? Doug: Just ice cream and occasionally Big Gay Ice Cream Truck t-shirts. Scoopalicious: Soft or hard ice cream? Doug: Only soft serve. I love dressing it up. Scoopalicious: What flavors do you carry? Do you rotate different ones in? Any "Big Gay" specials? Doug: The ice cream flavors are simply vanilla, chocolate, and swirl. Our topping menu rotates and new things come and go all the time. A big favorite is the ice cream sandwich with a layer of Nutella. Wow. Yum. Wish I lived in New York City! In the meantime, I'll just sport my new shirt in support! Thanks for the great interview, Doug! And thanks for the use of the great photo and logo! Officially.... AWESOME!!!! I have a big gay crush on Doug. Totally fabu interview. EB, you are the BEST! so, so, so cool. ice cream cool... great interview!